Sagada was our next stop after having explored the spectacular rice terraces of Banaue and Batad. 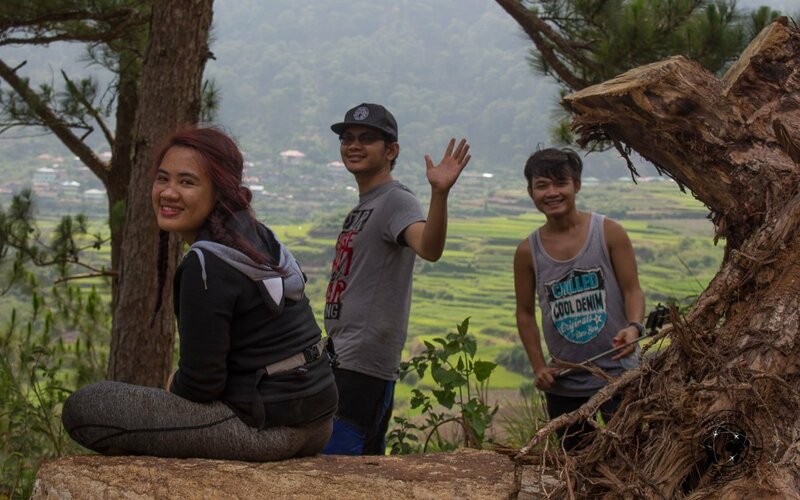 People we met raved about how beautiful Sagada was and how we should spend time there, so we booked a three-night stay without actually having a clear idea of the best Sagada tourist spots or having planned out a proper Sagada itinerary. Indeed it was a good decision, especially since the connection from Banaue to Sagada was an easy one, Sagada hotels are plentiful, and the little mountain town did not disappoint! 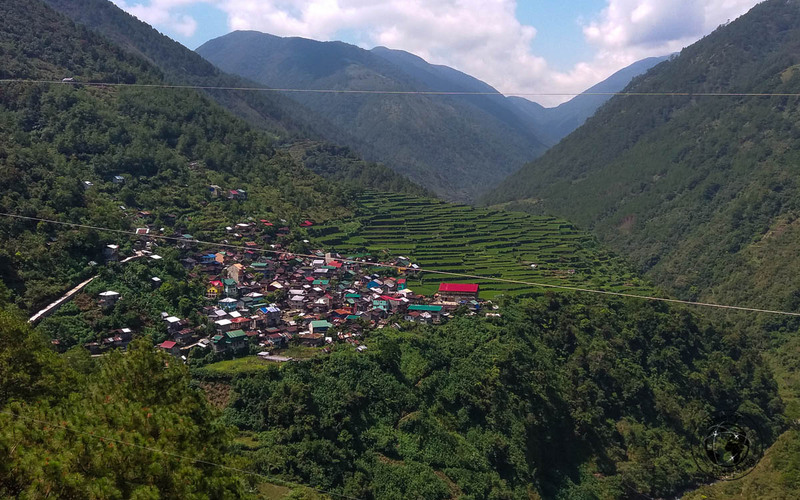 Here is why your Sagada itinerary should include the mysterious caves and coffins and gushing waterfalls, often considered to be the best Sagada tourist spots. Vans from Banaue to Sagada via Bontoc run every day. We were charged 300 PHP (€6) each for the full trip from Banaue to Sagada. Beware though! When we arrived in Bontoc, the van driver insisted that we get out of the van and take a jeepney to Sagada. With the help of a French couple who were riding with us, we insisted that this was not what we had arranged and an argument ensued. Luckily we had our receipt which clearly stated that the driver should take us all the way from Banaue to Sagada, which eventually he did. A van from Banaue to Bontoc costs about 150 PHP and a jeepney from Bontoc to Sagada costs 45 PHP, so the journey from Banaue to Sagada can actually be made for around 200 PHP per person with some waiting time and discomfort thrown in. The advantage of riding jeepneys is that the driver might let you topload (ride at the top) to take in the fantastic views en route. That said, when I tried to do it on the jeepney going the opposite direction, she was not allowed to do so! Overnight Coda buses run from the Cubao terminal in Manila to Sagada daily. They can be pre-booked here or online on 12Go Asia. Travel time is about 12 hours. Well, you can probably walk it too! Sagada is packed with adventure activities for those wanting to explore this part of the Cordillera region. Sagada tourist spots include hanging coffins, rice terraces, burial caves as well as caves for hiking & trekking, rice terraces and waterfalls – there’s adventure catering to everyone’s taste and budget in Sagada and it is not difficult to fill your Sagada itinerary with fun activities! 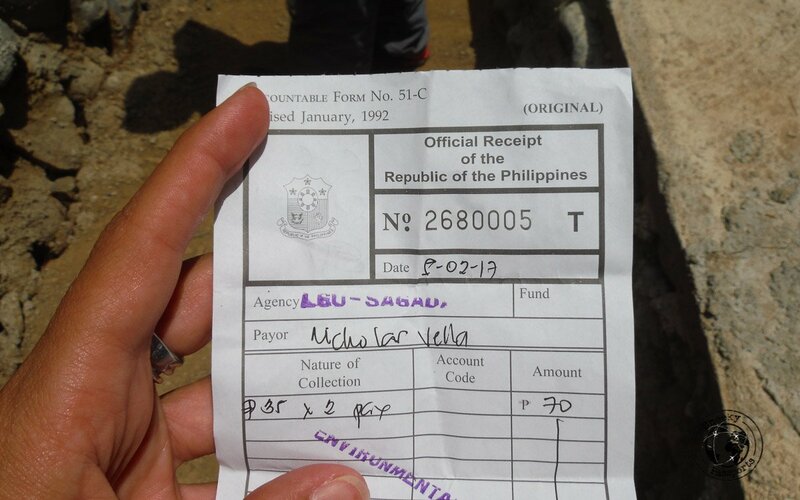 The first step once you arrive in Sagada is to register at the Sagada Tourist Office and pay a fee of 35 PHP (€0.70). You will need to carry your receipt around with you thereafter – you will be asked for it at entrances to many of the Sagada tourist spots. We suggest to take a picture of it to keep in your phone, just in case it gets lost or left behind. 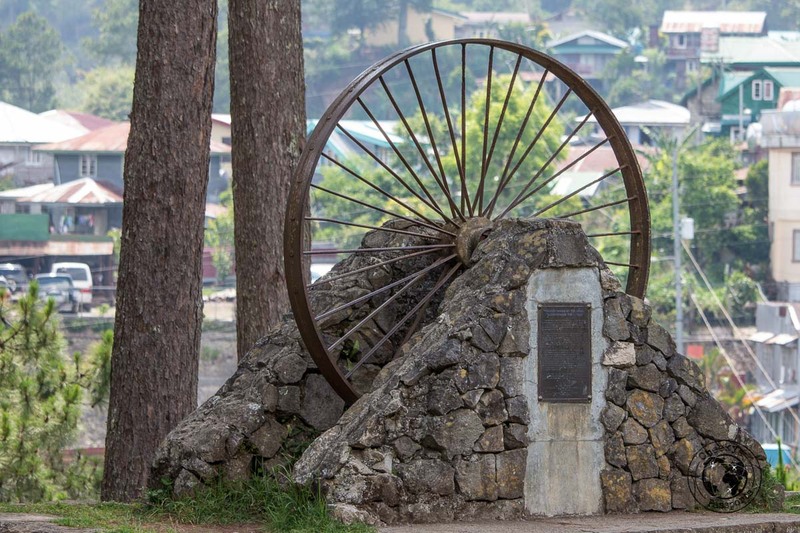 The tourist office provides pamphlets of various activities and a description of Sagada tourist spots in or around the little mountain town. 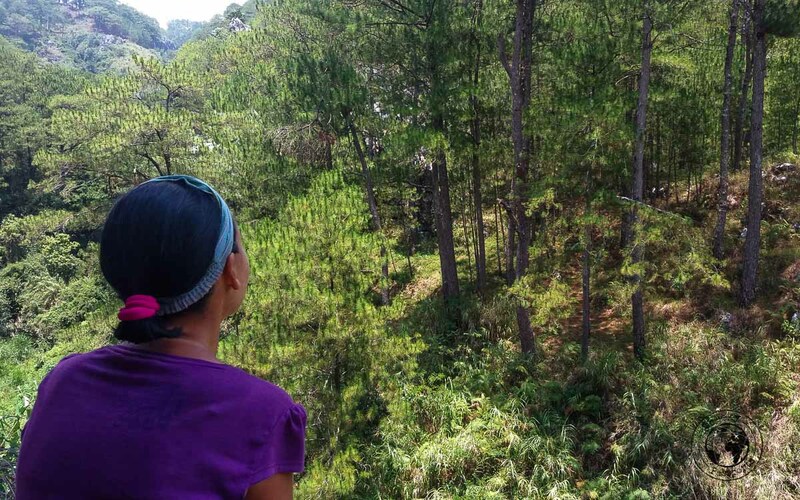 You can take a look at them and decide on what you want to include in your Sagada itinerary. Hiring a guide is totally recommended especially for exploring caves, which is impossible to do solo unless you are already familiar with them. All the notices in Sagada state that you MUST have a guide with you to explore any of the Sagada tourist spots and that you will not be let in unless you do, however recent information has shown that this is not a legal requirement. Guide fees for activities are standardised. There are various options to descend into Sagada’s inner depths if you so wish. The most popular caving experience is a two-hr hike into the large chambers of Sumaguing cave also known as “the Big Cave”. 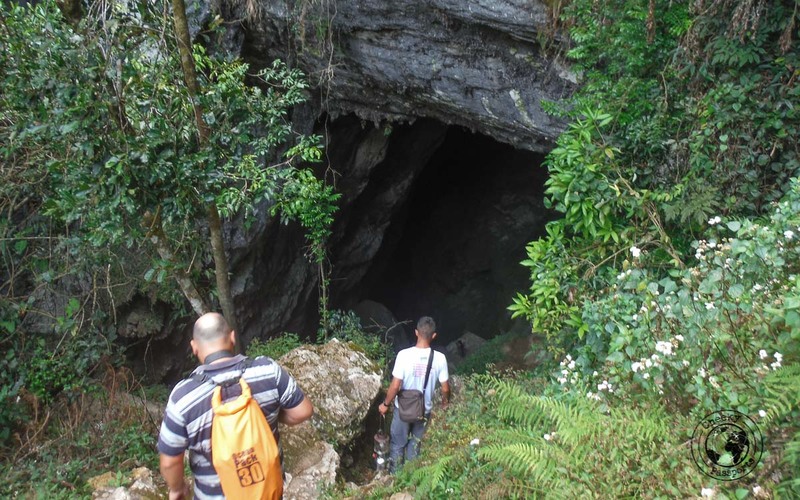 Another popular cave to include on your Sagada itinerary is the Lumiang cave or “the Burial Cave” which houses over 100 coffins at the entrance to its dark depths, some of which have been there for over 500 years. One way in which to explore both caves is to do the Cave Connection, a four-hour hike starting from Lumiang Cave and ending in Sumaguing Cave which are, in fact, connected. The spelunking tour costs 800 PHP (€15) for 1-2 persons. 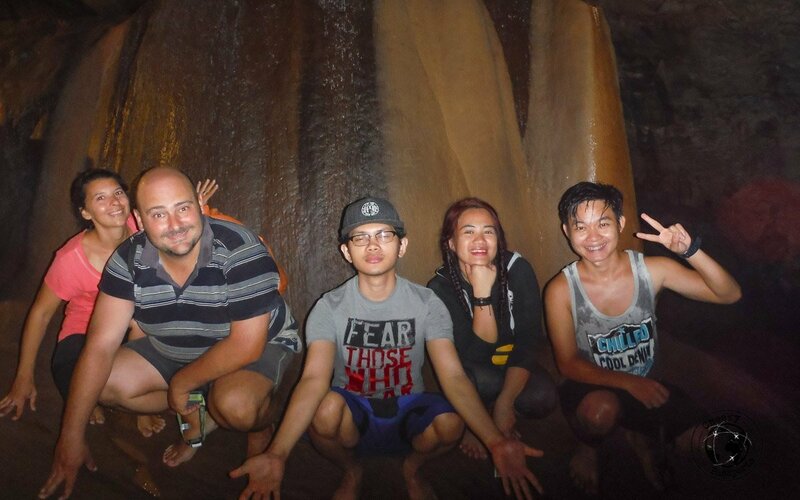 At the cave entrance we met a group of three Filipino tourists from Puerto Princesa who had not hired a guide but quickly realised that there was no way they could do this alone. They joined us for the tour which made it all the more fun! Our companions on the tour. 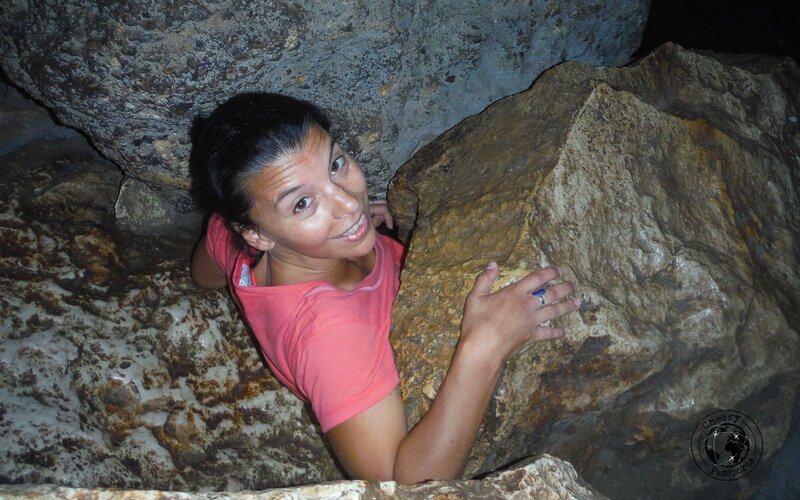 Our guide carried a kerosene lamp so I wondered just how adventurous this caving experience would be. We have explored caves in many parts of the world and we really hoped that this would not be just a “walk-through” but that there would be some climbing involved too. As we started moving in, the guide looked apprehensively at Nikki and laughed explaining that he was doubtful as to whether Nikki would be able to make it through some of the tight openings in the caves. “But how will he get through otherwise?” we asked. “Oh we will find a solution no worries”, the young guide answered. Okay, we weren’t very reassured, but reassurance is never guaranteed in the Philippines! Michelle making it through a tight spot. Nikki on the other hand …. If we had any doubts about the tour being adventurous, these were quickly put to rest right at the beginning. As we slipped and tried to find our footing around several sheer drops, pushed each other through tight holes and waded through icy-cold water, the adrenaline started to kick in and we excitedly moved on to discover more of the cave. We literally clung to the cave walls using our nails sometimes; letting go meant falling into deep crevices… there was a time when we pushed ourselves down through a black hole following the guide’s advice to move to one side immediately. There was a little ledge on the left where we could rest our feet. The rest of the passageway was indeed a hole with no bottom; had we not moved left immediately we would simply have fallen down a seemingly bottomless crevice! Alertness is needed at all levels. Do not attempt to do this if you are unwell or if you don’t feel up to it. It really can be very dangerous and accidents are likely to result in fatalities. Health and Safety Standards (as many are accustomed to in the EU and US nowadays) do not seem to be a priority in the Philippines as we have already noted in our tips. Our guide however, was excellent and took great care of our well-being! Even more so when we approached the tightest hole in the cave and realised that indeed, Nikki could not go through (I myself JUST made it through). By the end of it, he really managed to find another way for Nikki to climb down the route via a steep wall, with the guide himself acting as a human ladder. We only have the highest of praises for this guy! Besides, the sheer steepness of the falls from the narrow slippery routes we took, there are various points where you need to climb up and down ropes, wade through underground rivers and use your legs or hands for support to stop yourself from falling into oblivion. We loved it and we were glad we managed to survive it without any accidents! We do not recommend the experience to anyone who does not have adventure at heart, it is quite extreme, but if you love an adrenaline rush, be sure to include it on your Sagada itinerary! During our walk to the caves the guide pointed out a distant area with some hanging coffins. 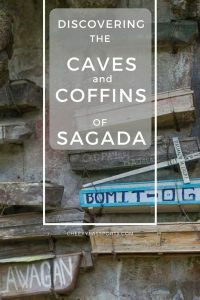 These did not look at all like the coffins we had seen in photos before getting to Sagada, and we wondered whether they were indeed what we had come to see. 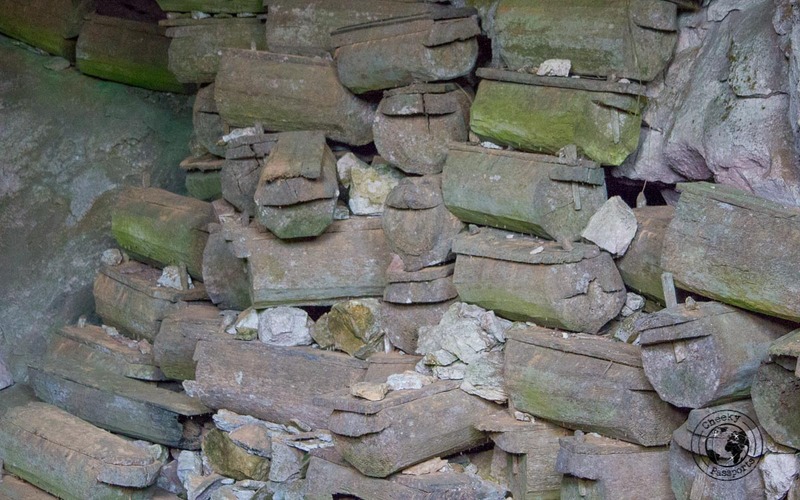 In fact the more famous Echo Valley Hanging Coffins are closer to town and can be accessed by taking a path by the church, just behind a cemetery. On this other route you can get close to the coffins and observe why this area is one of the most popular Sagada tourist spots. 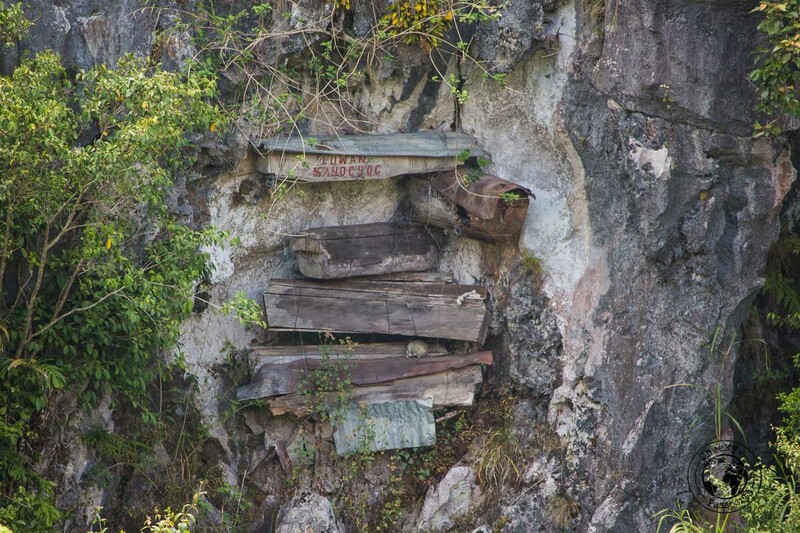 But first, let us start with a little bit of history about the hanging coffins of Sagada. 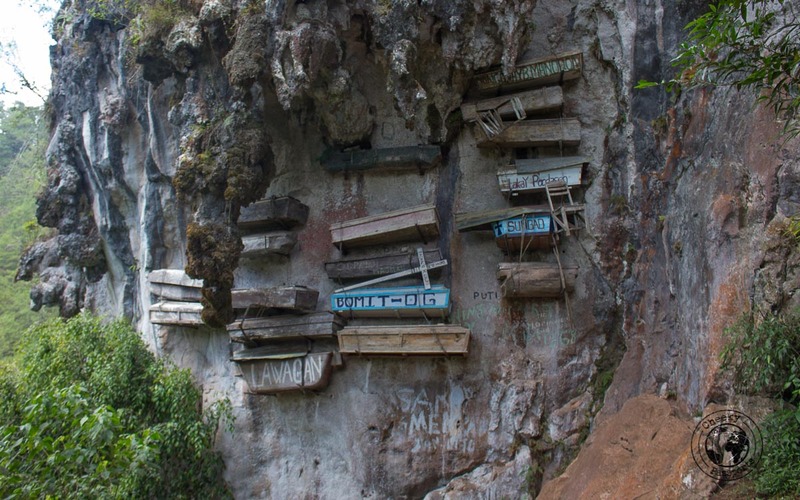 The Igorot tribe, indigenous to Sagada bury their dead in coffins which are nailed or tied to the side of cliffs so as to be closer to the sky and their ancestral spirits. Only those who die of natural causes due to old age can be buried in this traditional manner. The small coffins do not hold children as some might assume; they are this size as the dead are placed in the coffins in the foetal position, due to the belief that a person should exit the world in the same position that they entered it in. Related: Celebrating death in Tana Toraja! In some cases you can observe a chair also hung with the coffin. This is the same one on which the body was placed right after death as part of the ritual. The Igorots still practice this funerary custom until today although it has become very rare due to the introduction of modern burial practices. The sign outside the path to the coffins warned us that we needed to get a guide, which only cost 200 PHP (€4) so we didn’t bother to argue against it, although it is very easy to make your own way there. We cannot claim that the guide provided any particular value vis-a-vis a non-guided trip though! 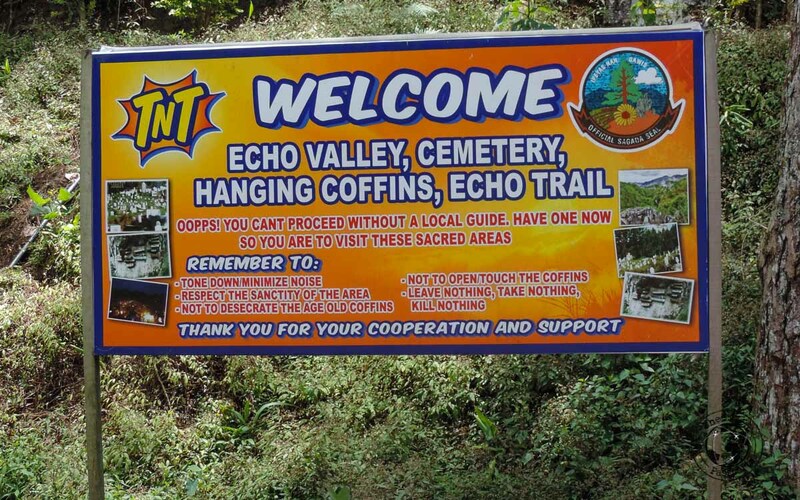 Be sure to include the Echo Valley Hanging Coffins on your Sagada itinerary! 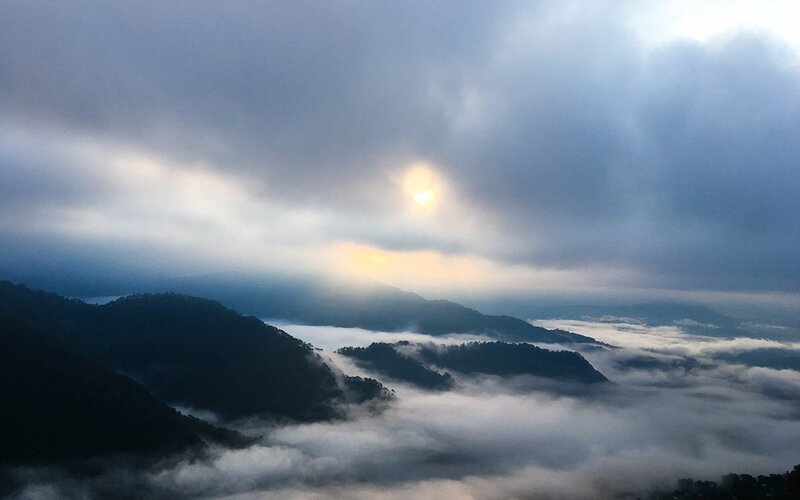 The sea of clouds among the Cordillera mountains from the top of Mount Kiltepan is as spectacular as it sounds making this one of the top tourist spots in Sagada. The best time of day to visit is at sunrise, meaning that you need to get up at 4am, but we can assure you that it is worth including this activity on your Sagada itinerary! You can get there via organised transport and then hike a short way up. Just be aware that this is a very popular activity so there’s a huge chance of finding large crowds waiting for sunrise. There are even local vendors selling food items and souvenirs! Hailing from a tiny country with 359 churches, we can’t say that we found this church to be in any way remarkable, but the surrounding grounds are relaxing enough to enjoy some peace and quiet in the shade of the trees. 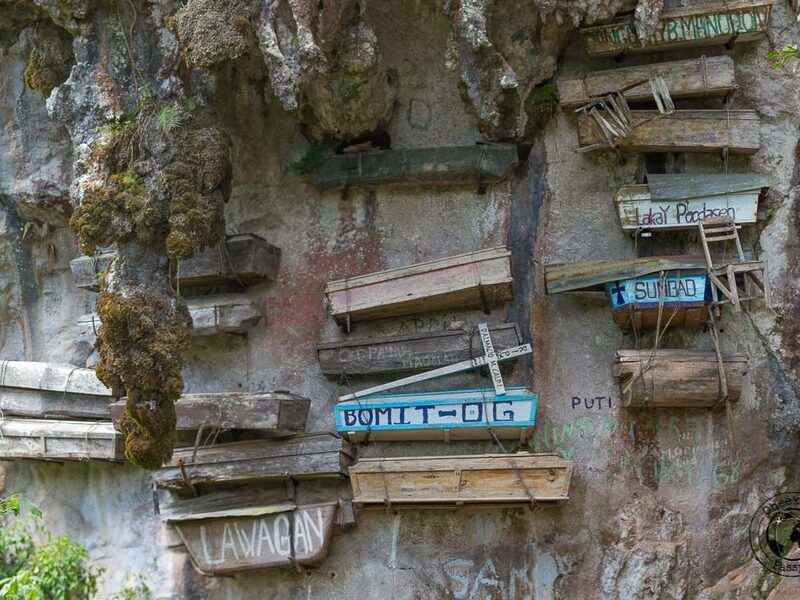 You need to pass by the Church to get to the Hanging Coffins so it is easy to include in your Sagada itinerary! Interesting to note that Sagada is the only town in the Philippines that is predominantly Anglican. A few hours’ trek among the rice paddies surrounding Sagada will take to you the lovely Bomod-Ok waterfalls, one of the best Sagada tourist spots. The trail is paved so it is easy to walk on, although you should wear comfortable footwear, but be sure to take enough water on your hike since it might get really hot. The gushing water is very cold, so swimming is at your own risk. The breath-taking scenery on the way to the waterfalls will leave you awed, so we really recommend that you include the Bomod-Ok waterfalls on your Sagada itinerary! Sagada hotels generally cater to backpackers, and it is easy to find affordable accommodation. If you’re looking at where to eat in Sagada, you might be glad to know that restaurants serve both vegetarian and meat-based meals, and you can even find brewed coffee, yoghurt and wine and some of the restaurants! We stayed at Kanip-Aw Lodge which is located down a hill about a kilometre away from the centre of town. Our room with a private bathroom was very clean and we had a whole floor to ourselves the whole time we were there. The room overlooked the valley with wonderful views of the forest, making this one of the best Sagada hotels when it comes to views. 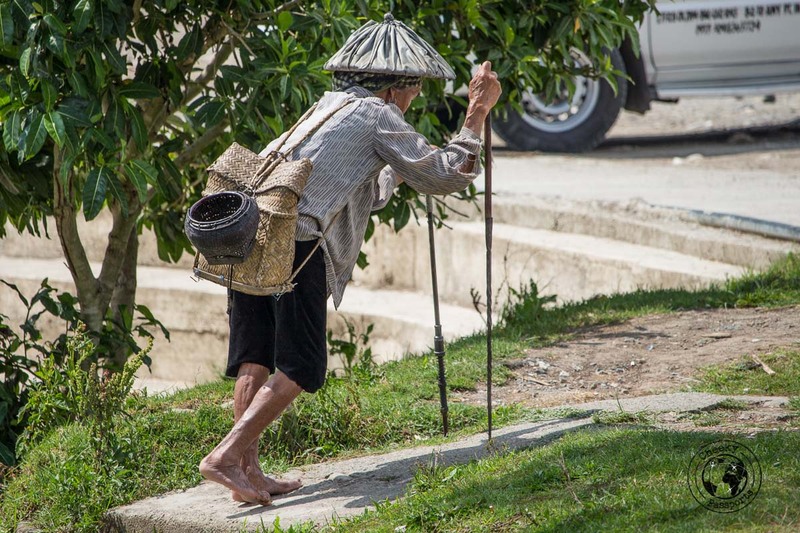 Once we needed to leave, we had to walk a kilometre uphill carrying our heavy backpacks, so be sure to factor this in when you’re looking at the different Sagada hotels! Find the latest deals on Sagada hotels on Booking.com or Agoda. Our absolute favourite (and everyone else’s it seems since it was always packed) was Yoghurt House, and this can even be considered to be one of the most popular Sagada tourist spots! Although we did think that the place was a bit pricey, we had one of the best pasta dishes ever here! If you’re looking at where to eat and you’re craving western food, this is the place to go to! Be sure to include it on your Sagada itinerary! We had our breakfasts at the Sagada Lemon Pie House. A meal of (very good) omelette, rice and sausage cost 100 PHP (€2) each and was filling enough to keep us going until dinner time, making this eatery one of the more affordable ones. Group photo of the caving team! 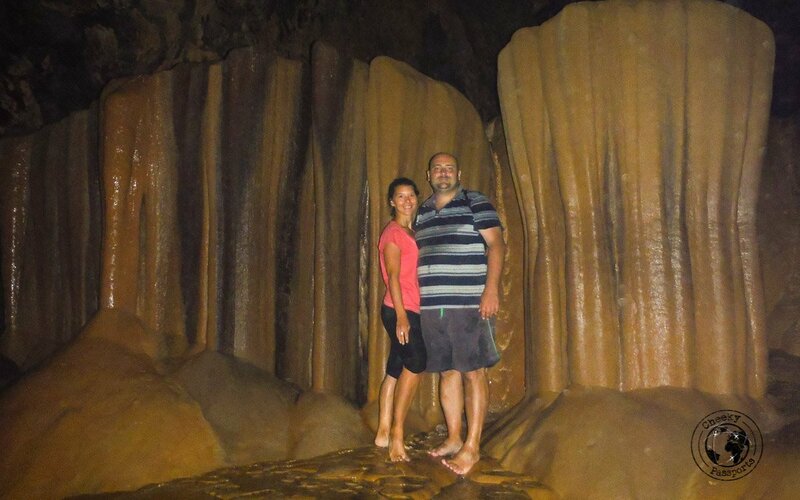 Although we had no pre-conceived idea about what Sagada would be like, we loved exploring the best Sagada tourist spots and we’re especially happy to have included the Cave Connection on our Sagada itinerary! Do not miss Sagada when you’re in the Philippines! Thank you for this. Hubby hasn’t been visiting back to his country ever since little and any bits of tips here and there is so helpful. We want to go there without the hassle of dragging his family too, with this we can visit places then his families. That’s great, there are so many places to explore in the Philippines! We’re glad that you found this helpful and feel free to browse through our other posts too, we have written a lot about this country! Oh my Goodness Gracious!! That’s totally an awesome experience! I’d totally totally love to explore this cave! Getting through those tight spots looks scary yet exciting! Those hanging coffins are just eerie!!! Thanks for that bit history about those coffins as well! Loved reading the history around the hanging coffins! I had always wondered what they were about! Lauren, glad that you found that interesting! They are rather surreal sight, just hanging there on a cliffside! I am not a big fan of caves as I am not comfortable with tight closed spaces. But it does look adventurous to explore a cave network. WOW … that hike through the cave sounds scary! Nearly falling into various black holes would freak me out … and also make me want to try it! Overall, the Philippines is a place I want to visit one day! I just love underground style tours, especially caves – we have some caves in the UK I love to walk around including Wookey Hole, they always give such a unique perspective. Those caves are amazing! I loved Philippines when I was traveling around the islands a year ago.